Home / Blog / 2013 Word of the Year! 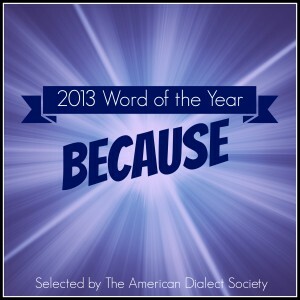 Every year since 1990, the American Dialect Society has selected an official Word of the Year. It is not necessarily a newly coined word, but a word that comes into prominence in some way. At their annual meeting, held the first week of January, they selected because as the 2013 WOTY. It seems to me that this use of because is intentionally derogatory or at least satirical. It implies that one’s opinions are only pseudo-rational — more knee-jerk and ideological than consciously logical. Though language purists will likely hate this usage, I like it quite a bit. I have a feeling it won’t last long, going the way of not (WOTY, 1992). But I’ll enjoy it while it lasts. For those interested, here are the previous WOTY winners. Last year I created a graphic including all 23 previous winners that you can download here.